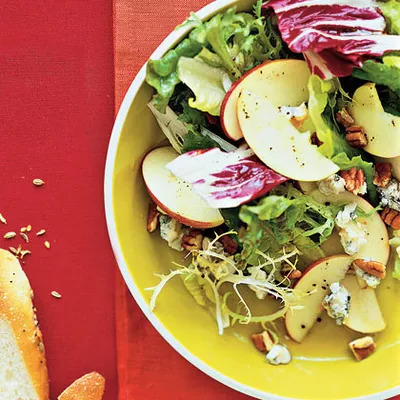 This simple salad combines goat cheese, pears, and sliced almonds, and you get all of this delicious taste for only 126 calories per serving. This recipe calls for store-bought, low-fat raspberry vinaigrette, but you can also make your own. Try our recipe for citrus vinaigrette, which uses fresh orange juice, fresh lemon juice, olive oil, low-sodium soy sauce, Dijon mustard, honey, and fresh ginger.